Since April, we have seen numerous clues about a version of the Samsung GALAXY Note and its 5.3 inch display for T-Mobile. The latest clue was the listing of the phablet and documents for the device under the carrier's support site. None of the support documents could be loaded because a password is required to access them at this time. And while it was hoped that the listing of the phablet on T-Mobile's support page would mean that a launch is imminent, the tweet gives the impression that we are going to receive some information to ponder before the device is actually in the hands of T-Mobile customers. The problem for T-Mobile customers is that a sequel for the Samsung GALAXY Note is in the works and is expected to launch this October. Rumored specs for the sequel include 5.5-inch WSXGA+ (1680x1050) Super AMOLED display, 8-megapixel camera, 1.5GB RAM, S Beam, S Voice, NFC, and LTE. While it certainly appears that the nation's fourth largest carrier is locked into launching the original Samsung GALAXY Note, there might be a point where offering it wouldn't make sense when another carrier, presumably AT&T, is about to offer the Samsung GALAXY Note II. T-Mobile customers who can't wait can always go after the Samsung Galaxy S III. While not a phablet in the sense that the Samsung GALAXY Note combines the look and feel of both a phone and a tablet, the Galaxy S III does have a 4.8 inch screen and the S Pen which allows users to write on the screen. But the form factor of the Samsung Galaxy S III says "phone" more loudly than the form factor of the Samsung GALAXY Note. this is too little too late for Tmobile. WHY didnt they get this phone when the AT&T variant was launched. i havent heard any issues with network capability so any other reason for the delay is an excuse! 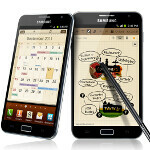 PLUS, why debut the original Note now when the Note II should be out with a few months?? You must not know how carrier exclusivity works. Att was the only carrier who could sell the Note in the US for a certain period of time. Buy it off contract, unlock it and throw in a T-Mo SIM. It's not rocket science. you could flash att note's radio to work with tmobile 4g. Look it up. I think it has pentaband technology. Main thing people have to decide is how much more will it do than an S3 and do they really need that extra capability. For a tablet,its very light and portable and with an ear piece,it can be used as a phone. I use my phones as info desks. To text,read articles from papers,magazines.Occasionally I ring people or they ring me. I have. To wear reading glasses so a big screen is a plus. For me then, a light,portable Tabphone with a big screen that enables me to read large volumes of text,watch footy scores,F1,Moto GP live is exactly what I require. Live Seidio cases so I really hope they're putting one out for the Note 2.